I’ve been grinning all week, and it’s not because I won the lottery or found a lost dog. 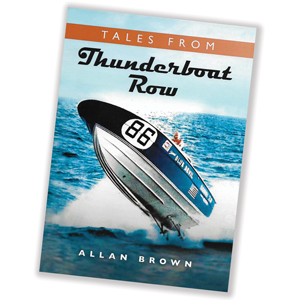 Allan “Brownie” Brown mailed me a copy of his new book, titled Tales from Thunderboat Row. Yes, NE 188th St., Miami, during what this gang of hombres likes to call the Golden Age of Offshore Powerboat Racing. Brown swears most of the tales are at least 95% true, and you hope no one was hurt in the other 5%. Brownie, as his friends call him, has appeared in the pages of PBB before, notably in No. 104; “Abbey and Brownie” was based on a day I spent with him and another veteran boatbuilder, Howard Abbey, at some tiki bar in the Florida Keys. You don’t have to get too deep into Tales from Thunderboat Row to realize how appropriate that setting, or a rented shop in North Miami, was for storytelling and drinking, but he was growing old, 71, mostly retired, enjoying the shade and comforts of his houseboat. Abbey, for those appreciative of our history, was a Brit whose family moved to the U.S. in 1924; he helped build the first two PT boats at Miami Shipbuilding, took a night class in lofting, served in the U.S. Navy during World War II, and returned to become a legend of sorts, notably the one who tooled up the first Hatteras for Willis Slane. Brownie also appeared in a roundtable confab of 1960s and ’70s offshore powerboat racers (“Fast Company,” PBB No. 155). Brownie’s CV is also impressive, as he jumped around just about every performance boatbuilding outfit in South Florida: Donzi Marine, Nova Marine, Cary Marine, Magnum Marine, Cougar Marine, Flight Marine, Cigarette Racing Team, Gentry Transatlantic, Holman Moody, and others. He built ’em and raced ’em, and therein lie the tales—funny, bawdy, entertaining, historically important, and mostly true. You don’t have to work your way slowly into this book, testing the waters as it were. The antics begin quickly. In 1964 Brownie, wife, kids, and friend Mike Collins were towing a Formula 233 to Buffalo, Michigan, to enter a race to Chicago, a relatively unknown event Brownie thought he could surely win. Driving through his home state of Indiana at midnight they plowed into a herd of black Angus. They dodged the cattle in the station wagon “but the Formula was in a four wheel drift back there, swatting championship prize bulls every which way.” Eventually they arrived at the race staging area on Lake Michigan only to see “the entire Mercury Marine offshore racing team,” and leading them, Odell Lewis, who had just won the Miami–Nassau race. In another of the 54 yarns in Tales from Thunderboat Row, Brownie, then at Donzi, was entered in the Miami–Nassau race with Sam Sarra, former chief engineer for Daytona Boat Works. Their ride was a 28′ (8.5m) Donzi Broad Jumper repowered with 500-hp (375-kW) Holman Moody NASCAR Ford engines that he estimated were about 8 mph faster than the competition’s. They figured to let the others beat themselves up in the Gulfstream and then crush them on the smoother flats. “A couple of miles before Gun Cay, we made our move. Flat out, passing boats in groups of two and three, we made a really hard landing, which stressed both the crew and the boat. The engines slowed a bit, despite the high throttle settings, and the steering stiffened up. I smacked Sam and pointed at the engine room. He raised the hatch. ‘Uh, oh!’ An exhaust pipe had broken off the inboard turbocharger, and the flame was shooting across the back of the engine room. Among the items in the flame path were the throttle cables (2), and the steering cables (2). They were welded into an amorphous mass. At this point, we were heading toward Gun Cay light at 50-some knots with the throttles frozen, and steering stuck straight ahead. As we approached the cut we shut off the starboard engine, and the boat lurched to the right. At just the right time, we turned on the starboard engine and turned off the port engine, and rounded the lighthouse just like everyone else. Unfortunately, we had to enter Cat Cay Harbour, where the Bahamas Immigration had wrapped our transire papers around a rock, to be thrown into the boat as we neared the dock.” Long story short, they got their papers, after “a few collisions,” jury-rigged the controls, and were about to head back when they noticed “an inch of 115/145 aviation gasoline in the bilge. I held the cable on the driveshaft while Sam smacked it with the sledgehammer and chisel. Little blue sparks would fly across the keel and go ‘Sssssssss’ in the gas and water in the bilge.” The smell (not the prospect of being blown to high heaven?) made them sick, and so they gave up. For a sense of how this race was run, here’s a video from the late 1980s, when Magnum Marine dominated. As Brownie observes early on, you can’t make this stuff up. The book is self-published and so has a few spelling errors, but here it seems to make the stories all the more authentic. Price is $100, same as Brownie paid for peel-and-eat shrimp when I met him and Abbey in the Keys (you ever go into a seafood store and say, “Gimme a hundred dollars of shrimp”? and pay with a C note?). It’s a nice round number that suits him. Send your check to Allan Brown, 1902 N. 23 Ave., Hollywood, FL 33020 USA. Tell him how you want yours autographed. Shipping is on the bard.